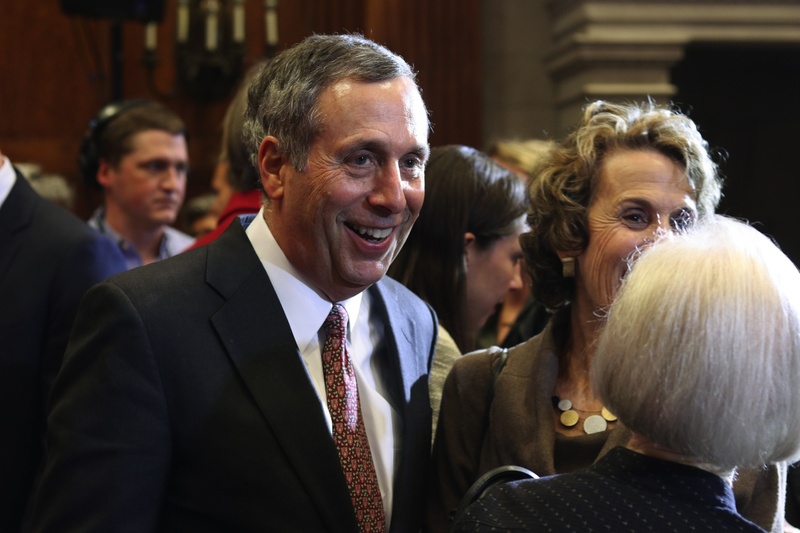 University President-elect Lawrence S. Bacow smiles at the press conference announcing his selection in Feb. 2018. 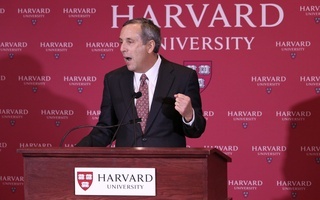 A coalition of faculty, staff, and students aiming to protect Harvard’s undocumented population met with University President Lawrence S. Bacow Wednesday to discuss their goals with the new president. The meeting fell roughly a year after the Trump administration terminated Deferred Action for Childhood Arrivals — an Obama-era program that allows undocumented youth to live and work in the United States — and about nine months after the administration announced it would terminate Temporary Protected Status for residents from El Salvador, Haiti, Nepal, and Honduras. TPS provides legal protections to immigrants from countries plagued by violence or natural disasters. Roughly 65 Harvard affiliates were undocumented in the 2017-2018 academic year, and dozens of staff members are TPS holders. The coalition that met with Bacow formed in an effort to bring together immigrant advocacy groups across campus. 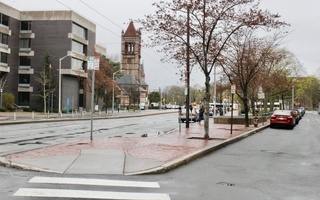 Dubbed "Harvard Community Organized for Immigration Action," the coalition consists of organizations including Harvard College’s Act on a Dream, the Harvard TPS Coalition, and the Graduate School of Education’s UndocuAllies. “I would say that one of the big goals for this meeting was for it to be one of the first formal ways of all of these various individuals coming together as a single community and using their voices as one,” said Elmer Vivas Portillo ’20, Advocacy Co-Chair of Act on a Dream, who attended Wednesday's conference with Bacow. Bacow took office in July. Ever since, he has criss-crossed campus — spending time in dining halls and at student events — to meet with undergraduates, faculty, and staff across Harvard’s schools. This meeting, which was originally slated to include 46 participants, ultimately involved just eight activists. Administrators told coalition members that construction at the site of the meeting forced cuts to the guest list. “There were a lot of voices that were not heard because there were less people represented — and maybe organizations represented — but I know we made a great attempt in trying to get a variety of people represented within even the smaller group,” said Ariana Aparicio Aguilar, co-chair of UndocuAllies. 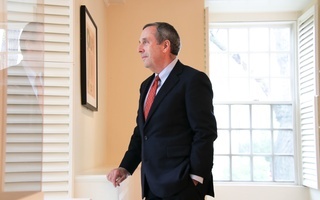 In an interview with The Crimson ahead of the meeting Wednesday morning, Bacow said he has spoken to lawmakers in Washington, D.C. to advocate in favor of protecting undocumented people. He pointed to his own personal history — his mother was a Holocaust survivor who immigrated to the United States — as one of the reasons he cares passionately about the issue. 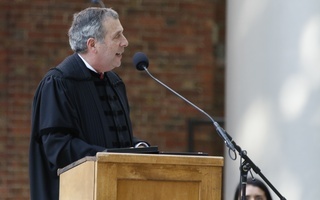 “I also talked to people about immigration issues, about DACA, about the importance of continuing to extend the protection of Temporary Protected Status for students, for staff, for others, why it was important that places like this continue to be open to talented men and women from around the world,” Bacow said. 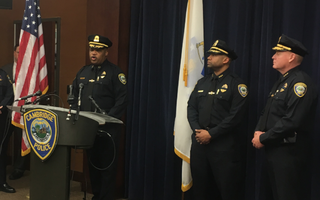 “I think we have a moral responsibility to try and be responsive to the needs of those who are most vulnerable,” he added. At the meeting, members of the coalition raised three main concerns: the need for legal support for those at risk of deportation, the need for mental health services, and the need to secure work authorization for TPS holders. Another main goal of this meeting, Vivas Portillo said, was to create a centralized platform detailing resources available to undocumented Harvard affiliates. “It's wonderful that we have a lot of resources at the University, whether it be immigration clinic, whether it be spaces like Act on a Dream or spaces of the graduate schools, but one of the things that we feel is this idea that it feels fragmented,” Vivas Portillo said. Vivas Portillo pointed to a recently created website that compiles many of these resource, adding that he hopes to build on these efforts in the future. “This was an initial conversation and we’re looking forward to a follow up with the President’s office to implement some of these goals, and also we look forward to having more resources being representative of the undocumented immigrant population,” Aparicio Aguilar said.